I could go into how it’s fair because they did the work in the past to earn the money required to afford this treatment, while those complaining chose to watch TV during the evening instead of doing something to be more successful. I could go into how it’s fair because this amusement park is a private company that is allowed to make their own line structure and that if we don’t like it we can vote with our feet and not show up. But this argument can be difficult to understand without enough background in economics, freedom, and what makes a society prosper. Instead, let’s look at why it’s actually in the best interest of those without the money to have this special option available for those with the money. First, consider the cost of entrance. Those people without much money probably think the cost is already really high, especially when you have to spend so much time waiting in lines and not getting the opportunity to go on as many rides as they would like. If the cost is what it is because the owners of LaRonde want to make a profit, imagine what these owners would do to cover the costs and still earn the same profit if they didn’t have this extra income stream. They would probably raise the price of admission. So with the ability for those with enough money to pay for the privilege of not waiting in lines, they probably allow those without as much to get in for a cheaper price. This is hard to see however, as it is not the current reality – only a possibility that at this point is only in our minds. 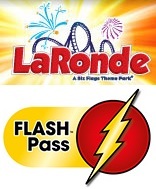 Maybe this setup actually allows some people to get into LaRonde who wouldn’t be able to afford it without this opportunity. Maybe the cost of a whole family would be big difference in the ‘everyone is equal’ scenario with no one being able to pay more. For more of an explanation on the idea of what is not seen, and it’s importance, see the end of the article in this link. Distinction, in effect, drives people beyond the normal effort they would expend for mere monetary rewards. Thus, when distinction is not possible for most people within a society, productivity levels predictably decrease. Whereas distinction incentivizes societal growth, its absence disincentivizes the same. Although distinction may appear to be a minor point, in reality it is vitally important. People are not like draft animals, which can work obediently so long as they are provided food, drink, and shelter. In contrast, human beings must believe their efforts will lead to increased distinctions and rewards (metaphysical progress), or they will mentally “check out”. Rare is the individual, in other words, who will strive for great accomplishments without the ability to reap the commensurate rewards. So letting people with the money to use it in this manner is a concept needed all over society just to motivate people to do more with their lives. We need these ‘extras’ available in life to keep people working harder, to keep the economy growing (or reverse the decline) and to create more prosperity for all. Now you might be thinking (like my co-worker) that we don’t necessarily need this particular distinction here, that there is many other things in the world to strive for. You would be right. But then the question is where would you draw the line? In each area of distinction, we would be able to argue that it is not necessary in that particular case since its available elsewhere else. You may also feel that amusement parks are no place for this kind of distinction, that the kids don’t understand these things and that it causes problems when they don’t understand why other kids don’t have to wait. This comes down to parenting, and how you react to the situation. You can be the parent who doesn’t like to deal with difficult situations, or one that wants to give their kids everything they want. You may be more interested in being friends with your children than be their parents who will raise them. For these parents I have no real answer for you… this situation, and all others like it in the world will be problematic for you. But here is why I think this can be good, and here is my advice. You can use this as a lesson. Since distinction is so important, you can use this to explain the differences out there, that some people have more than others, and that those who go out and be successful in life, have certain advantages; like not having to wait in line at an amusement park. Give them something to look forward to, to help motivate them to do more with their lives instead of complaining about what others have. If you are worried about them thinking less of you for not providing them this option, tell them if this is something they want, they will have to earn the privilege themselves. If they are really too young to understand this concept, then they probably wouldn’t notice the distinction of others in the first place. You can also use this a financial education lesson, pointing out how society is set up to get people to spend money they don’t have (many of the people who pay for these passes are almost certainly in debt). You can point out that you are not spending extra on this extravaganza because it will mean having less for more important things later on, while those participating will have have bigger problems down the road. I do understand where he is coming from however, and I don’t blame him for thinking the way he does. He doesn’t want to have to listen to his daughter complain, or have to deal with her questions at a time when she wouldn’t understand the answer. But ignorance is not bliss; to hide how the world works from our kids, is to stop them from being ready for the world when it’s time to face it on their own. Great post Lee! Most people are too intellectually lazy to think through issues like these, and instead result to knee-jerk, child-like reactions out of a heart of envy and entitlement. I’m looking forward to the day when we’ll have audios and books on economics coming down in our LLR series from you. Lee, thanks for the very level-headed argument you make on this. I frequently find myself thinking the same as your coworker, or similarly enough, but as you clearly point out, it is fair. After all, any who are willing to put money on it can gain an identical privilege. As I regularly encounter people who complain about the same, I shall have to point them to this rather well written article.